Thankfully, eight years later, the band has re-emerged with the most excellent Present Tense, an 18 track opus that finds the band more relaxed than ever before. No longer bothered with trying to create a massive hit single and rake in the dough, Present Tense feels like the most honest and down to earth Any Trouble album yet. The songs on the album may not be as frantic and direct as they were 35 years ago but they still convey the same passion wrapped in hook-filled melodies. Most of the tracks are acoustic-based rather than full on electric so that adds a bit of warmth to the album as well. Add in a Motown beat here, some handclaps there and some great guitar leads and you’ve got a set of outstanding Any Trouble tunes. This is a band fully aware that they are not young kids anymore and they embrace their maturity. Songs like “Glen Campbell” (the first single), “Rocking Horse,” “She’s Not Like All The Other Girls,” and “Learning How To Lose” are right up there with the best Any Trouble recordings… in fact, the whole album is a real treat. For this writer, the only misstep is “Great Big City,” a song I still can’t ‘connect’ with even after a dozen listens. Most of the songs are certainly a band effort although there are a few that sound like the more upbeat moments on a Gregson solo album (that is far from a complaint, mind you!). And did I mention that the album has 18 tracks? That's damn near a double LP release! 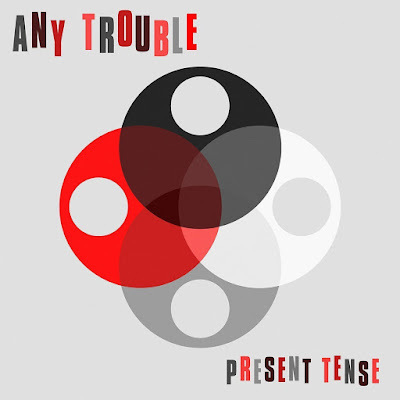 All in all, Present Tense is more than a great return for a sadly overlooked band, it is proof that there is plenty of life in them yet! P.S. I haven't done any research as of yet, but I'm pretty damn certain that the song "Glen Campbell" was inspired by the fact that Glen Campbell recorded a song called "Any Trouble" on his Ghost On The Canvas album!